The chambered cairn at Kilmashogue is known as a wedge tomb, you can see from the above image that the cairn has been quite flattened, but you can also see the remnants of the surrounding ditch and bank which would have been a lot deeper when it was first constructed around 2000 B.C. Some of the original kerb stones are still in place. The gallery is rectangular in shape with an antechamber separated from the main chamber by a very high sill-stone. There are a number of cist graves that have been inserted into the cairn at a later date. Unfortunately due to it's close proximity to the city this monument has not always been treated with due respect, on numerous visits I have found many beer bottles scattered around the site and even the remains of a fire lit on the actual stones. But please do not let this put you off visiting, as the site is set in a wonderful location, the views over Dublin from the Car-park are splendid. 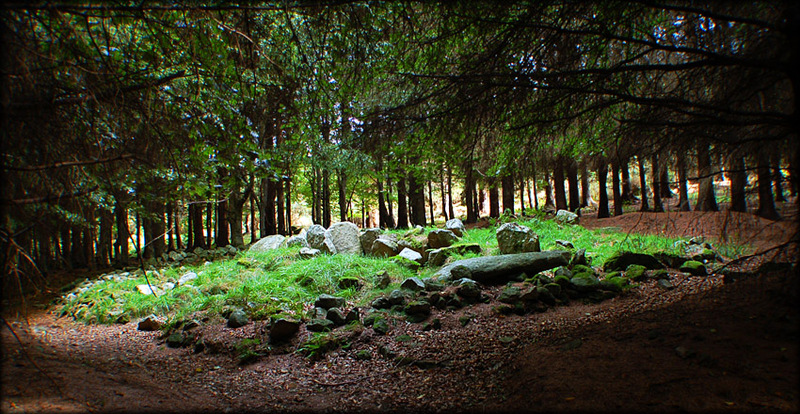 There are many other megalithic sites situated in the Dublin mountains not too far from here, including Kilmashogue portal tomb and another wedge tomb at Ballyedmonduff. Situated: From the M50 take the Knocklyon exit, head east on the R133, turn right at the next crossroads after the R116-Whitechurch Road. Drive up here keep left at the roundabout, as you go under the M50 flyover turn left at the roundabout onto Kilmashogue lane, go up the lane till you see a small car park on your left. Take the steps and cross the road to the small track going up into the woods. The cairn is 50 metres up this track. Discovery Map 50: O 1503 2439. Last visit Sept 2006.